Through the use of extended graphical abstracts and some traditional text-only abstracts this collection provides, a record of and roadmap to, the research presented at The Tenth International Catecholamine Symposium (XICS) held in September of 2012. Organized around ten general themes, each is introduced by a short overview identifying interesting research programs, results and potential areas of growth. 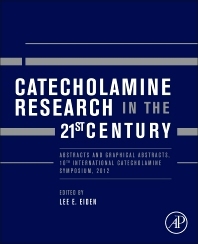 The collection is a roadmap to key research and future opportunities for new catecholamine research programs and will be of interest to neuroscientists and clinical neurologists interested in understanding the current and future state of catecholamine research. Are the Enzymes of the Catecholamine Biosynthetic Pathway Locally Synthesized in the Axon? Does Impaired Aldehyde Detoxification Play a Role in Parkinson’s Disease? D2 Functionally Selective Ligands: novel Therapeutics? A Role For Neuronal MHC-I Display in Parkinson’s Disease? What is the Optimal Biochemical Diagnostic Strategy for Pheochromocytoma?